I attended a property briefing in Cheras the other day and found that they actually have a category of home buyers which they target, i.e. ‘Buying for the children’ group. That’s exactly what my hubby and I had done. By the time when my eldest son start working, homes are going to be too expensive for him. So, we decided to purchase a unit of condo for him and my second son. The property is in their names and our plan is to pay the necessary down payment, apply for the loan and when he can afford it, he can continue servicing the loan. We are also exploring retail outlets for restaurants since both he and second son are into this industry. So far, we haven’t find one which we can afford in Penang. That’s how our adventure takes us to Sunway Velocity. 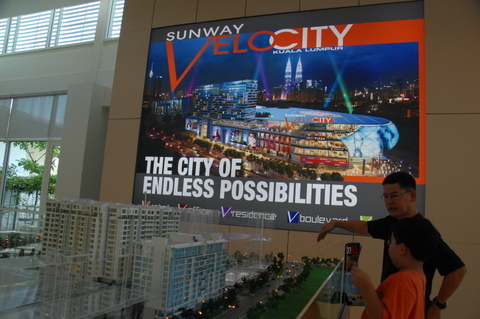 If you have not heard of Sunway Velocity, it is the new and ambitious project by Sunway. So far, Sunway projects are like goldmines and all of them have been successful. If we can grab an early offer, hang on to it for a couple of years, we definitely can make a nice stash of cash or have a nice place without paying exorbitant rentals. Friends in KL warned me that the project may cause major traffic jam. The other thing they told me to watch out is the surroundings. I got there on Saturday morning and had some really nice noodles and roast pork. The place reminds me of Perak Road in Penang with the majority of traditional Chinese hawkers and small industries. Soon enough, the traffic jam and traditional surrounding worries were erased by Sunway Marketing Manager. He is from Penang too so he knows what I mean when I hinted about Cheras and it’s image. He told me there are several projects coming up in the area and soon, a new look will take over. Those businessmen will probably own some of the new properties. Hawkers will surely move to modern outlets. The Sunway Velocity project sits on a huge 22.2 acre land and accessible through three roads. There are plans to divert the traffic, very much like how Sunway Pyramid sits by the highway and yet easily accessible. When I look at the prices per sq ft of this property and compare it to Penang, it does look rather attractive. However, the retail lots are of course not affordable by me but still a good price if you compare with the properties in KL itself. Their selling point is how near Cheras is to KL, i.e. a mere 3.8KM and serviced by two LRT stations. So, it is still an ideal location because of the short distance from the city centre. We had a tour of their show units which aren’t available to the public yet. Bloggers have our advantages, no? So, I brought my little boy along and asked him if he likes the layout of the service apartment. The little apprentice told me he likes it because of the 3 bedrooms and one small room hidden in the kitchen. There are plenty of spaces and the size of the bedrooms are rather spacious too. In a gist, Sunway Velocity can be described as an ideal and choice property because they have incorporated a huge shopping mall, a nice park, some office blocks and service apartments in the project. All these are inter-connected with what they call the environmental deck which is walking paths with no vehicles. And don’t forget that it is a freehold piece of land. Plus a 5,200 car parking lots are certainly very comforting because it is a nightmare to think of that. 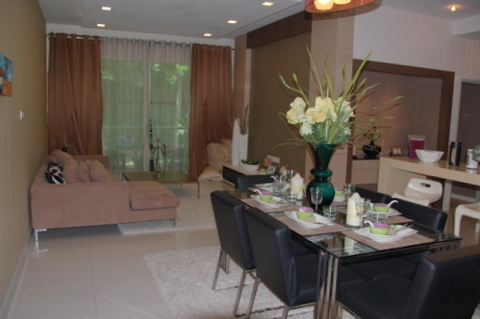 So, if you are looking for properties to invest it, check out Sunway Velocity. They have service apartments for small families to floating bungalows to shops and offices. Click here (link to www.sunwayvelocity.com) for more info on the development.